The Books for Walls Project: Get the Scoop at Your Library: Go Ahead, Celebrate National Library Week, All Year Long!!! Get the Scoop at Your Library: Go Ahead, Celebrate National Library Week, All Year Long!!! ”Be a little careful about your library. Do you foresee what you will do with it? Very little to be sure. Ralph Waldo Emerson, find works by him at your library! Show your support on your Facbook page! Thanks to @ your library you can easily edit your cover image to show your support with this fun graphic, click here to make it happen! April 8-14, 2012 is National Library Week which, according to the American Library Association, "is a time to celebrate the contributions of our nation's libraries and librarians and to promote library use and support." will get out there and use their library! Our little local act in support Interlochen Public Library: we donated 50 snazzy pocket "How to Keep a Book Journal" books and recycled bamboo pencils. IPL liked the idea so much they insisted on buying more --thanks for the support IPL, especially Amanda, nice work on all the festivities!! Thanks for the support from Blackbird Arts in Traverse City --who just happen to be the featured art in the McGuire Community Room this month at the Woodmere Branch of Traverse Area District Library. And to Crystal Crate and Cargo in Beulah for donating the wonderful pencils. And thanks to our secret donors, you know who you are; The Dad for helping The Mom assemble the final 10 journals; to The Sister's Gramma who wrote with her lovely handwriting on so many of the pencils; and to The Sisters and the BFWP Family of Readers, we are grateful for your endless support. 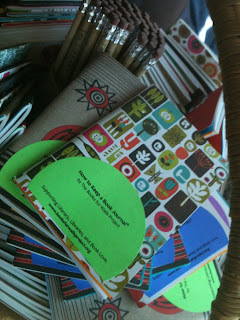 Want one of these lovely journals for yourself or how about a bunch for your reading group? With every journal you purchase we donate one to a local library's Summer Reading Program! We're pretty giddy about our new pocket sized journals --thanks to ecojot for giving us a great deal. With a bit of layout fun, editing, cutting, a table of activity, and don't forget glue sticks --we have 200 lovely journals to share. Stay tuned for our own "Buy 1, Give 1 Campaign" --details coming soon! Watch this short film about ecojot's trip to Haiti, we've set our sights on helping them with their outreach --who knows, when The Sisters are 18 maybe we can volunteer with them?! Learn more about the ecojot "Give" program, click here, and get inspired to help spread literacy around the globe! New to the library? The Sisters created Library 101 just for you, click here and get started! Did you know that many libraries are hubs for GREAT ART? Check out your library and ask about their programming and/or installations --you may be surprised! And check out Library as Incubator Project, wow, so much inspiration, watch out, you WILL be inspired! At the Books for Walls Project we never have ads trying to sell books; rather than buying a book we suggest you first try to find it at the library. Need a little help? Try starting with www.worldcat.org which helps you find a book at a library nearest you, wherever you are! Interested in the State of America's Libraries? Read the 2012 report, hot off the presses --read on, click here. "Even as budget-cutters take aim at libraries and their services, more than two-thirds of the 1,000-plus adults contacted in a survey in January said that the library’s assistance in starting a business or finding a job was important to them, according to the poll, conducted for the American Library Association (ALA) by Harris Interactive. Sixty-five percent of those polled said they had visited the library in the past year; women are significantly more likely than men (72 percent vs. 58 percent) to fall into this category, especially working women, working mothers and women aged 18-54. Overall, 58 percent of those surveyed said they had a library card, and the largest group was, again, women, especially working women and working mothers. College graduates and those with a household income of more than $100,000 were also well represented among card holders, according to the survey." Follow the Books for Walls Project, we promise to keep up to date on library news (Get the Scoop at Your Library) and have a bunch of bookish fun. Click here for ways to keep in touch. Do you love YOUR Library? Add it to our Favorite Libraries List -click here to check out the list, click here to add your favorite library. Tell us a Library Love Story, we LOVE stories or tell us why you love your library (we shared out top ten) click here and read more! Visit our Facebook page for some of the latest on local library National Library Week activities, little goodies and bookish info.